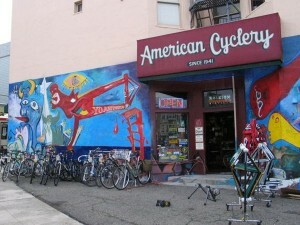 The San Francisco Bay Area is a bicyclist’s dream & the “7×7” is equipped with the best local bike shops. Several stores even specialize in high-end / custom road bikes and locally made messenger bags & cycling gear. Whether you dwell in the Mission District, Hayes Valley, Upper Haight, North Beach, the Marina , or even Dog Patch; you can find boutiques with cyclocross, touring , hybrids, hipster cruisers, fixies, single speed and even electric bikes.